Disclaimer: Bible is my specialty, not science. Not that I don’t appreciate science. First, like most people, I am the happy benefactor of all sorts of scientific advancements from medicine (thank God for anesthetics!) to the technology enabling me to both write and distribute this message. The list is virtually endless. Second, I love hearing explanations of the intricate and complex wonders of the physical world. From the smallest of the small to the biggest of the big, and everything in between, the universe is mindboggling. A few months ago, I took up the challenge given me by an atheist friend to watch the 2014 science documentary series “Cosmos: A Spacetime Odyssey” with Neil deGrasse Tyson, the follow-up to the 1980’s “Cosmos: A Personal Voyage” with Carl Sagan. I am glad I did. The way it takes the viewer into the wonder of God’s creation is most impressive – not that Tyson acknowledges the universe’s divine origins. Far from it! The purpose of the challenge after all was to convince me of his naturalistic evolutionary perspective. I was struck by some of Tyson’s closing comments when he stated science’s commitment to going wherever the evidence leads. He may believe in what he is saying, and I understand that science-minded people see themselves as bastions of reason. I don’t have an issue with the importance of reason as a key ingredient in our journey towards truth. But the tendency among people like Tyson to give the impression that they live in a realm defined by strict observable and provable analysis is hypocritical. Forgive me for making such a negative statement, but when our postulations are self-contradictory, what are we left to conclude? Perhaps Tyson and others are sincere in their convictions. If so, then they are self-deceived. How dare I be so sure of my assessment? 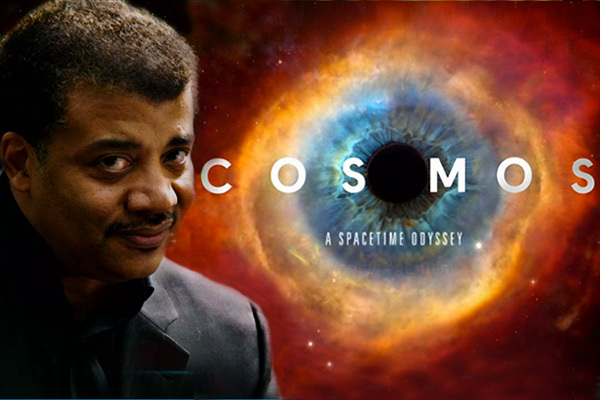 Watch Cosmos; listen to Tyson. Listen to him say that we don’t know what initiated the big bang or how life began. Those are really big foundational unknowns. Yet that doesn’t stop him from making all sorts of confident claims about how the universe and life developed over vast periods of time. Where does the evidence lead when some of the things they are most sure of are unknowns? The atheist’s naturalistic approach to origins and life’s development shuns any hypothesis that might include God. They must, therefore, compel themselves to fill in great gaps with naturalistic explanations. They can’t seem to admit that physical evidence only takes a person so far. Science is limited to tools of observation. But not everything that is real is observable, including the past. Even our modern advances in recording events are incapable of actually taking us back in time or – even if they could – give us the eyes and ears of the past’s contemporaries to sufficiently understand what happened then. How much more are we unable to make scientific determinations about the ancient past? Rock layers and fossils are evidence, for sure. They love to tell us the rocks speak, but they don’t. There may be much we can learn from careful, intelligent analysis, but we cannot formulate an accurate picture of the processes through which their current state came to be. Make guesses? Yes. Be certain about our resulting answers? I don’t think so. I was intrigued by the Cosmos segment where the apparent evolutionary development of the human eye was presented (You can watch it here, but don’t forget to come back!). The eye was chosen, because they are aware how intelligent design proponents use it as an example of a complex system that could not evolve over time, no matter how long. Tyson dismissed that by explaining that original simple cell organisms were blind, but eventually certain bacteria developed indentations sensitive to light, giving them an advantage over other bacteria. As time went on, this most basic eye, became more complex until eyes like our own came into being. Where does the evidence lead? For Tyson and others, such an explanation dismisses the concept of creation. But does it? He offers nothing to demonstrate that any of this actually happened or how. Just because there indeed exists in the world of today a great variety of eye complexity doesn’t necessarily mean that one type of eye naturally evolved into another. What’s really going on is the atheistic worldview prejudices the conclusion. If only Tyson and company would actually follow the evidence where it leads. I shook my head almost every time he drew me into creation’s wonders. Both he and I were equally awestruck, yet he couldn’t admit how science reveals how unknowable the universe is even though he was making a case for it. What does any of this have to do with our weekly portion? The Haftarah occurs during a time of great famine due to being under siege by the Syrians. Four outcasts, lepers, decide to surrender to the enemy. Arriving at the Syrian camp they find it deserted with all their bountiful provisions left behind. When showing the evidence of this to the city officials, the leaders tentatively conclude it’s a trap. But thankfully they decided to investigate further and adjusted their thinking accordingly. Science’s inability to determine life’s origins is not because they don’t analyze evidence, it’s that they don’t analyze it enough. If they would be more honest about the unknowns and their implications as well as work harder to not be controlled by their prejudices, they might be surprised to discover where the evidence will lead them.